wunderbug: linky love + weekend! goodness! i'm so incredibly glad it's friday. 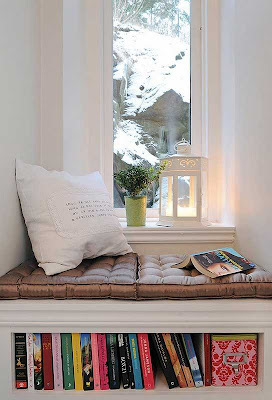 i need to find myself a place like this to curl up and unwind. possibly with a good book (from my booklist!) and a good glass of wine. late post today; it's been a busy week of wrap-ups and new beginnings. my internet connection at home got fixed (turns out you need to re-set routers once in a while to keep them from getting out of line!) but then the power flickered and my wireless connection was MIA once again. so much for getting work done at home! however, in the brief window of time that i had to kick back and read some blogs, i managed to get quite a bit of catch up and commenting done (i do try to comment on a regular basis but sadly, i become a lurker when i'm tight for time!) and let me tell you - it's like visiting friends that i haven't seen in a while. i've included a few links that i love below - check em out cause they rock! cindy's week sounds a lot like mine. did you read the other boleyn girl? check out katelyn's real-life adventure related to it here! oh weekend, i'm so glad you're here. oh, glad to check out these links! thanks for including me too! now i really have to stick to my plan! oh boy, thank you for including my sleepy self! i love many on your list, too and will check out the others. i already love the playlist. rest up and gave a good weekend! I love your links--always something fun and new to discover! Thanks!